Pssst! Wanna See a Dirty Girl? I have a confession: I’m kind of a mud mask junkie. Like, potentially, I might really have a problem. I love the way it feels to smear wet mud on my face, making funny pictures as I go. I love the way I can then walk into a room and scare the pants off my 7 year old son (hey, you gotta keep them on their toes, right?). But most of all, I LOVE the way mud make my skin feel! Tingly, refreshed, clean, and amazingly smooth. I still make my husband pet my cheek after most masks, so I can amaze him yet again with how unreal my skin feels. Because it really does feel unreal, everytime! So yes….. I frequently mix dirt with water and spread it all over my face. But I don’t just use any old dirt to this beautiful mug. I’m talking about high quality clays, oh course! Bentonite clay, French clays, Aussie clays, Moroccan Lava clay, Canadian Glacier Clay….. the list goes on and on. We use a wide range of clays in our Red Lemon products, but today I want to discuss using clays straight up for your face. Why Clay? Why is THAT good for your face? 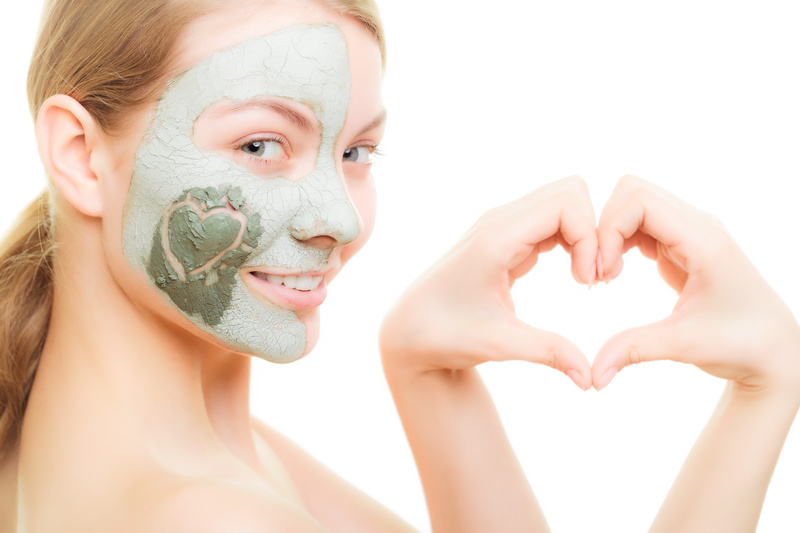 There are many types of clay, and each type has its own benefits for your skin. Most clays are very rich in minerals, and being that clay is a natural substance, these minerals are in a readily available form for your skin to absorb. It’s easy to forget that our skin is a living organ, with a porous surface, and dermal absorption is a very quick and effective way to nourish our skin! Another benefit is that many clays have detoxifying abilities. Most high quality clays are dried naturally by the sun, which in turn, ionizes them. What does this mean? Well, clays like Bentonite, for example, have a powerful negative-ion charge when hydrated. This ionic charge attracts positively charged bacteria, contaminants and toxins, binding them and drawing them out. When used as a face mask, these clays clear out toxic buildup that’s been left behind from our environment, chemical-based makeups and other synthetic face care products. So, why is clay good for our face? Well, to put it simply: because it cleans out the junk and feeds with the good. Why does Red Lemon sells their masks in powder form? This is a great question! For most clays, the ionic charge and mineral benefits are activated through hydration. IE, when you make it wet, the active properties are animated. We want our masks to be therapeutically effective for our customers. We let you hydrate the mask yourself, as you need it, to ensure full potency. Also, this allows the mask to pretty much keep indefinitely; although, I don’t think you’ll find shelf life to be a big problem! We’ve actually had customers ask us if they can mask everyday! Um…good question. How often should you mask? This is entirely up to you and your skin type. Personally, I mask every 2-3 days. Do I NEED to do it that often? Probably not. But I enjoy it and my skin loves it, so I go for it! Using the Mask ‘Correctly’? How complicated can it be to smear wet dirt onto your face?! -Hydrating your mask usually works better with fairly warm water. Mix the clay powder with the water, stirring it very well until it’s about the consistency of sour cream. If the clay isn’t instantly absorbing the water, for whatever reason, just let it sit for a minute or two to give the clay a chance to sponge up. I haven’t found this to be a problem with our Red Lemon masks but it’s a good tip to know, just in case. -Some people like to mix their masks with unpasteurized Apple Cider Vinegar or raw honey instead of just water. This makes a double wicked mask, if you are so inclined! But it is absolutely not necessary. -It’s best to mix clay masks using non-metal spoons and bowls. Metal can deactivate the ionic charge in the clay. For our masks, we provide a bamboo spoon with each purchase. Simply wash the spoon after mixing and it can be used again and again. I actually use this wooden spoon to spread the mask over my face as well. It works well as a spatula! -To wash off the mask, use a steamy warm cloth and rinse it out frequently. Be aware that if you are using any red or pink clays, that they might stain your cloth a bit. I have a basket of old cloths in my bathroom and I just use them to wash off my makeup and masks. That way, I don’t have to worry about ruining our ‘fancy’ cloths! -After a clay mask, your face might feel tingly from the increased circulation and your pores will tighten. It will be a good time to follow up with a natural toner (to whisk away any residual mud particles and balance the pH balance of your skin) and then also a rich, nutritive moisturizer, preferably something synthetic-free so your face can breathe. I use our Petal to the Metal Rosewater Toner and Sweet Cheeks Fortified Night Cream. Let me tell ya, massaging rich moisturizer over an oh-so-smooth face is heavenly! The Great Debate: How long should you leave a clay mask on? When I was a teenager I used a few face masks. I would spread them on and wait for them to dry rock hard. Then I’d stretch my face in all kinds of embarrassing ways to watch the dried clay crack and crumble. After washing it off, I’d invariably need to apply lotion to my face for the rest of the day, as my skin was suddenly bone dry! 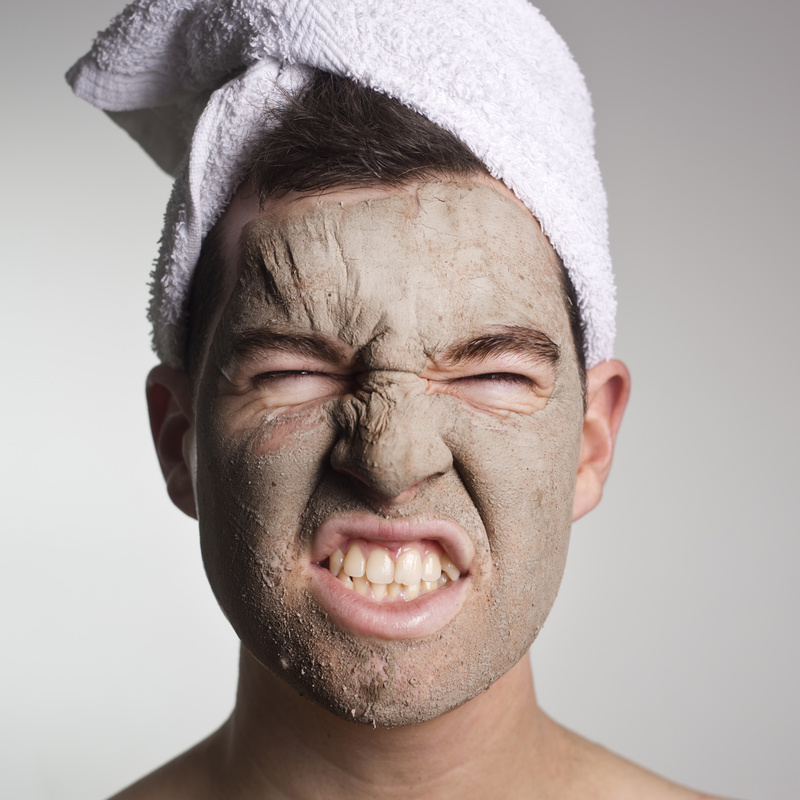 There are three phases to a clay mask. First off, there’s the damp phase, where your skin absorbs all the beneficial minerals from the clay. Then comes the half-dry phase, where the ionic charge of the clay clears away the toxic buildup from your skin, your capillaries are exercised, and then your blood flow accelerates as the mask cools and contracts. Great! But then comes the dry phase, where the clay continues to absorb and inevitably draws out moisture from your skin, causing your face to feel dry, tight and sometimes itchy. So the next time you use a clay mask, don’t wait for it to reach the super hard, dry, flaky stage before giving it a rinse. Instead, try using this easy-peasy touch test: When your mask starts to dry (you’ll notice the color is getting lighter in big patches) but you can still feel that it’s a little bit sticky in a few places, then it’s the perfect time to wash that sucker off. That way you can get all the benefits out of your mask without any unintended consequences! Lol As with many other things in life, good timing can make all the difference! So go ahead and try it already! Do it! Join the face mask party! Be warned that it might become a slight addiction….but a healthy one at least! At Red Lemon, we have 3 clay masks, each designed to support a different skin type/need. Personally, I rotate between all three, because frankly, I just can’t choose a favorite. And I enjoy seeing all 3 colorful bags lined up on my bathroom counter, like a cute little face mask smorgasbord. 🙂 So try it! And I hope that you enjoy these ‘dirty’ little products as much as we do! Come check out our online shop for more info on these products!